The Google Home, Siri, Amazon’s Alexa, DeepMind’s AlphaGo, self-driving cars, the Nest, Netflix, your email, and your bank are just a few of many examples of Artificial Intelligence (AI) where machine learning is present. AI is a computer’s ability to gather data, make decisions, and take action without human interference. Machine Learning comes into play as the computer learns from each of these actions to continuously improve the process. How Does This Affect Paid Search and Why Should We Care? The best way forward in this brave new world is to educate ourselves, ask questions, and start testing. “Set it and forget it” should never be used to describe a paid search strategy. So, let’s dive deeper. Smart Bidding, also known as “auction-time bidding,” uses machine learning to optimize bid strategies toward your chosen performance goal. Some of these include Target CPA, Enhanced CPC, and Maximize Conversions. The Smart Bidding algorithms use historical account data, industry performance data, and individual users’ behavior patterns to glean a variety of contextual signals that help maximize results. Some of these signals include devices, time of day/day of week, remarketing lists, locations, browsers, demographics, and the list goes on. This is more data than any person or team could analyze and make decisions on efficiently, which is why it’s worth an experiment. Audience targeting is the ability to target a specific group of people based on their online behaviors. As Google gathers data on an individual, it creates a persona for that user, groups them with other similar users, and allows advertisers to target specific messages to that group. If someone is still in the research phase of the “sales funnel,” do you want to prompt them to purchase? No. You want to educate them so they’re equipped to make a decision and drive them further down the funnel to eventually become a customer. There are so many ways to get creative with audience targeting but here are some of the newest. 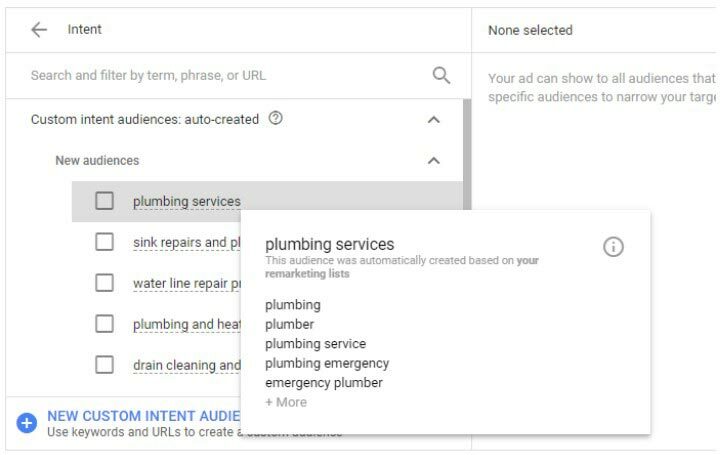 Previously only available for Display and YouTube, this helps marketers differentiate the meaning behind a search query. Does someone searching “Denver broncos schedule 2018” want to eventually purchase tickets or are they just trying to plan out their watch party menus for the season? Basically, this strategy takes a user’s search history into account to determine who is ready to purchase/convert and who is not. The best part? Google quotes a 10% increase in conversion rates for companies using In-Market audiences for Search. Need to expand your reach? If your remarketing list is large enough (at least 1000 cookies), Google may give you the option to target Similar Audiences which are exactly what they sound like: a group of users with search patterns similar to users on your remarketing list. This functionality allows advertisers to reach an audience to which they may not have been previously exposed, all based on Google’s machine learning technology. If you’re running Display campaigns, consider testing Custom Intent Audiences. Display campaigns have needed more refinement from Google for some time now and this seems to be the jumping off point. Custom intent audiences target “people who want to buy the specific products you offer—based on data from your campaigns, website, and YouTube channel.” These seem to be much more targeted than other Display options which, as a control freak, I appreciate. Cheers to lower funnel traffic from the Display Network! First, I feel obliged to say there is a “create your own” option that allows advertisers to mix and match keywords and URLs to give the algorithm an idea of the persona you want to target. However, we’re focusing on the automated option because this blog is about machine learning and all its glory. If you choose the automated route, Google will have already created audiences for you to choose from based on the above mentioned (neat!). This is especially helpful if you’re newer to AdWords. As you can see in the photo below, there are auto created custom intent audiences already and when you hover over one, you can see the associated data from your account used to create that audience. If you’re thinking, “This sounds too good to be true, there has to be a catch.” You’re right; there is. To qualify for this conversion model, your account must have at least 15,000 clicks and a conversion action must have at least 600 conversions over a 30-day period. 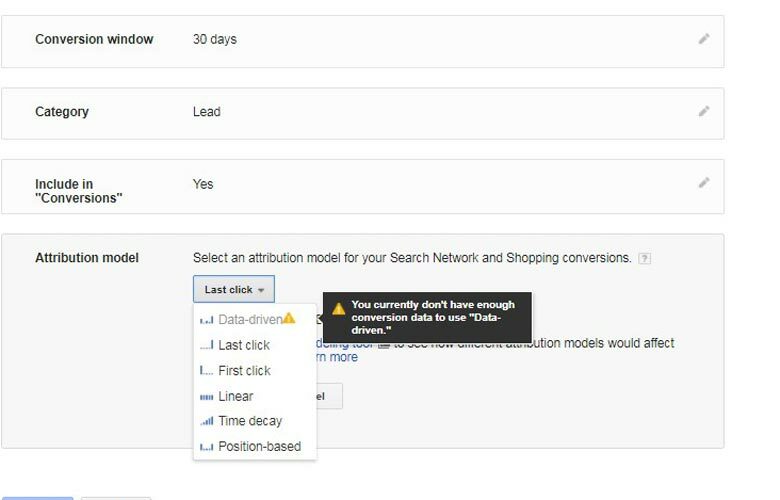 If you begin using this method and your account data drops below 10,000 clicks and your conversion action shows fewer than 400 conversions over 30 days, your conversion attribution model is automatically switched to a linear attribution model. I am VERY excited about this one; it has been a long time coming. Currently only available for Gmail and YouTube, life event targeting allows you to target users who are going through specific life events such as graduation, marriage, or a move (whether it’s renting or buying). Advanced machine learning and mapping technology allows you to more accurately track store visits by simply enabling location extensions. Yes, really, that is all you do. Google will supposedly only report on store visits when the data meets their standards of accuracy but users must have opted in to activate location history. As with any other updates Google has rolled out, test, adjust, and test again. Not every strategy is going to work for every goal, industry, scenario, etc. Let the data speak for itself, and then make decisions. It’s going to be a long time coming before AI and machine learning can fully substitute for the role of paid search marketers, so for now, it’s one of many tools from Google to help us advance paid search strategy.